I get annoyed when people take their kids out trick or treating and don’t bother to give candy out. Now, wait, before you get defensive, I know there are some reasons as to why people don’t give candy. Some people leave way out in the country and drive their kids to neighborhoods so they can get candy. I get why they don’t pass any out. Some people are struggling with money and such—times are tough. But some people just aren’t being fair. I live on base. This means that a lot of the time, the person in the military is deployed or has to work. (My husband has to work security on Halloween a lot.) This means that the remaining parent has to take the kids out so they might not be there to pass out candy. This is what I do: I leave a bowl of candy out with a sign that says PLEASE TAKE ONE. So far, I haven’t had a punk kid take it all. I know this can happen. But even if it does happen, I feel like I’m still offering something to the neighborhood. The amount of houses that weren’t passing out candy was astounding. Yes, some people might not celebrate Halloween. Some people might take their kids to the mall, zoo, etc..I get that too. But really, if you take your kids out to the neighborhood, you should offer up SOMETHING. This is what we did on Halloween: my husband actually didn’t have to work so he passed out candy while I took the kids around. Last year he did have to work so I left a bowl out for the first hour. Then when we came back I started passing out candy. This base has a crazy amount of kids. Last year we ran out so I made sure to get like 10 bags of candy. Why? Because I feel if I can take my kids around to various houses, that I should have plenty to offer others. Again. There are reasons why some people don’t. I get that. Now, if you’ll excuse me…I’m off to snack on some Reeses Peanut Butter Cups. Oh and PS. Someone put this sign on their door. It's blurry, sorry. I quickly took it lest the cranky inhabitants inside came out yelling. They seemed cranky. I mean, they could have just wrote NO CANDY and people would have understood. But they took it further. DO NOT RING DOORBELL. I believe the next line was "No one will come." Followed again by NO CANDY. Sheesh. Okay. Got it. Wow it is rude especially the note left! My friend that is a single mom does the same leaves a bowl and note...last year she came home and someone took all the candy and the bowl...can you believe that! I had only 12 kids we live more in the country and the houses are far apart..I still bought three bags just incase. Wow, that's one rude note! Yikes! we seen a few of those 'notes'last night as well and tons of houses with lights on and decor and no one home...we started to learn theh ouses that thel ights are on every year and no one there! I dont leave candy out in this neighborhood ever there are NEVER trcik or treaters here and one day hoping to be in a better area for this time of year ;) Glad all had fun! My husband is rarely home for Halloween so when he is we always want to take our kids out together as a family, but we ALWAYS leave a bowl of candy out. We trick or treated in the pouring rain last night, and I was amazed at how many houses DIDN'T have candy/weren't home. I've noticed to happening more and more over the 14 years of taking my kids out. It wasn't very fun! I think looking forward, we will stick to Trunk or Treating and Halloween parties. that note is ridiculous. If I was say a punk kid, I would ring their doorbell just cause. Ugh, that is annoying. I have the opposite problem - I always have tons of candy and only a few kids ever come to my door! It's like they want me to eat it all myself - why do you hate my health, neighborhood children? I think the worst offense is when trick or treaters come, and they arent even dressed up. I had a kid say "oh I have vampire teeth in my pocket" when I asked what his costume was. fyi - he was dressed in a tshirt and basketball shorts. grrr. Not many kids out in the neighborhoods we hit, and very few houses with lights on. Different than it used to be. We had that problem last night too. And living on post, come on people, you KNOW there are kids everywhere! We left a bowl out while we took the kids, then gave the rest out when we got home! I did leave a bowl out because I just couldn't deal with Halloween on an emotional level and it was all going so well. Kids were taking reasonable amounts of candy. Til the last kids of the night. My husband said I bet you there is no candy left. That was mischievous laughter. Sure enough, some punk kids emptied our bowl. And there were Snickers in there that I was planning one eating later Grr. Still won't stop me from passing out candy though. Oh my gosh that is crazy about those people putting that sign out, geez! That note is funny. 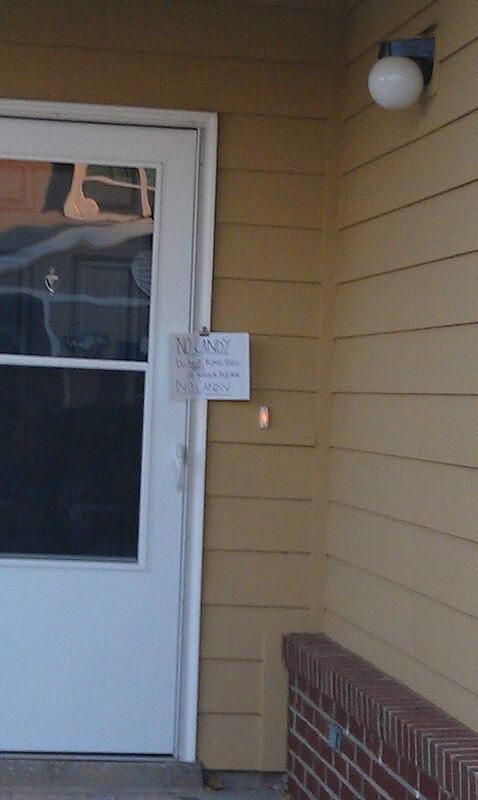 Last year in Hawaii I had to put a note up saying No More Candy because they were ringing my doorbell! Agreed! Living on post, which I've done for the past 10 years until now, means TONS and TONS of kids. Military kids and non-military kids. And you go through a ton of candy! This year we're in Germany and most europeans do not celebrate Halloween, so we drove to post for trick or treating. I'd say 75% of the houses did not offer anything. My daughter got plenty, but she had to get in a lot of exercise for it, lol! What bothered me this year was the doorbell thing. Not rung once. But repeatedly and quickly. Or SITTING on the thing. We got home rather late and the German kids, who were not even dressed up!, were ringing the American houses looking for free candy. Not cool. Don't show up late, without a costume and rudely ring my doorbell. You aren't going to get anything you will want that way!! You should have rang the doorbell. You should have written on the note - Then turn off your damn porch light! Everyone knows that's the universal "We have candy" symbol.